The Cascade Team: Core Clock Hours For Brokers AND Catered Gourmet Burger Bar! Tuesday, April 17th, 2018 at 12:41pm. Great class today at The Cascade Team main office in Issaquah. Over 30 Brokers today took the Core Curriculum class which was instructed by Larry Christensen, and which was fully paid for by The Cascade Team in order to ensure that our Brokers are always on the forefront of the ever-changing world or real estate. Phil Mazzaferro from Absolute Mortgage thank you for kicking off the morning with some of the biggest donuts "Janet" has ever seen and also for sharing some news on several exciting new loan programs offered by Absolute! 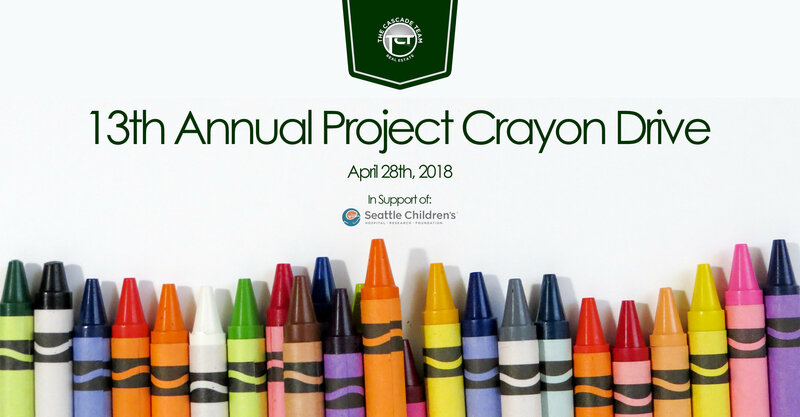 Collection Dates, Locations and Times For The 2018 Project Crayon Drive Announced! Thursday, April 12th, 2018 at 2:29pm. Tuesday, April 10th, 2018 at 3:00pm. In Seattle — home appreciation exceeded the median household income over the past year. Home values in Seattle have been appreciating more than 3.5 times faster per working hour than the cities’ minimum wage workers earn. In Seattle, the typical homeowner is gaining $54.24 of equity in their home every hour they’re at the office. The city’s hourly minimum wage is $15.00. The typical U.S. homeowner is gaining $7.09 of equity in their home every working hour, $0.16 less than federal minimum wage. The rapid pace of home value appreciation over the past year may present homeowners in Seattle with an interesting dilemma: Why work a 9-5 slog, when you can sit back and collect substantial hourly home equity “earnings” instead?